London: Parliament House (designs for). Unfinished designs showing two schemes, one probably for ceiling decoration that is rectangular with panels and rosettes; the other shows a radiating pattern for a niche. You are here: CollectionsOnline / London: Parliament House (designs for). 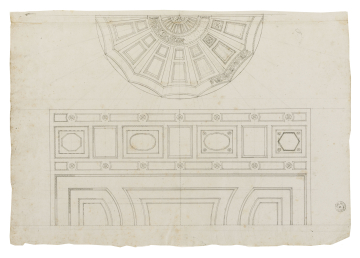 Unfinished designs showing two schemes, one probably for ceiling decoration that is rectangular with panels and rosettes; the other shows a radiating pattern for a niche. This drawing is part of James Adam's Parliament House scheme of 1763, and the hand can be compared with that in Adam vol.7/12.